YOU write: "I have yet to see a proper memorial in Germany to the innocent civilians of WW2 killed by Allied bombing. The only one I have seen is a demure tablet on the wall of a dusky railroad station passenger tunnel in southern Bavaria, marking the place where one American bomb killed 200 civilians huddled during a 1945 air raid." "Remember the dead. 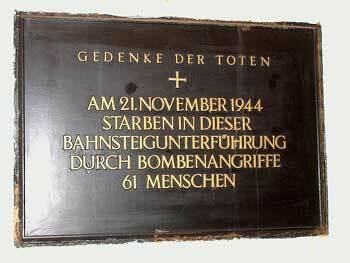 Sixty-one people died in this railroad pedestrian tunnel in bombing attacks on November 21, 1944." Several more of these do exist, although you will be hard-pressed to find any details on who were the perpetrators. The attached example can be seen in the train station of the small village of Hünfeld, about ten kilometers northeast of Fulda. Hardly comparable to a memorial, of course, and I seriously doubt there shall ever be one. The debate that sprung up in Germany after Jörg Friedrich's Der Brand hit the shelves has already quieted down again, and given way to more, ahem, persistent issues of remembrance.